Did you make a batch of Roasted Winter Veggies last week? If you haven’t eaten all the leftovers, use them for this delicious and hearty soup. I prefer to use all vegetable broth, but didn’t have enough last time so I used a combination of vegetable and chicken broth. It was excellent! I serve this with my family’s favorite rolls or some bakery bread for dipping and that makes a meal in my house! In a large stockpot, warm 6 cups of broth. 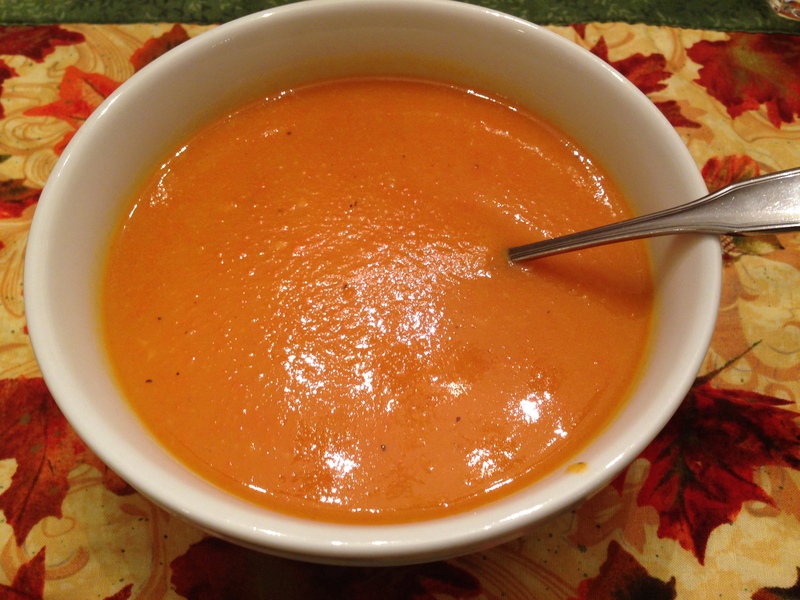 In a food processor or blender, puree the leftover roasted vegetables in small batches with some of the broth. The vegetables do not puree completely, so don’t worry if you see small pieces of veggies throughout. Return soup to the stockpot and salt and pepper to taste. Add more broth until it is the consistency desired (I usually end up using all 8 cups of broth). Serve immediately. Adapted from Barefoot Contessa Family Style, 2002. Oh it looks so wonderful! Thank you for checking out my blog! I LOVE to cook, but this has become more challenging as both my husband and son have alpha-gal and I am vegetarian and allergic to all shellfish! Needless to say, the question, "What's for dinner?" requires more time and effort these days. I was inspired to do this because more and more people are being diagnosed with the alpha-gal allergy every day and because I have had so many people ask me what we eat. If you have been newly diagnosed with AG or are simply new to my blog, PLEASE VISIT THE "ABOUT MY TAGS" page FIRST. This will help you understand how my recipes are tagged so that you can find the ones that meet your families needs. It is my hope that this will help other families with the alpha-gal allergy find new ways to enjoy dinner together again. FOLLOW ME: Click on the "+Follow" box in bottom right hand corner to receive all my latest recipes!